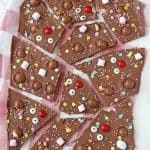 Get the kids involved in making some treats for Red Nose Day with this fun Chocolate Bark topped with malteasers, marshmallows and sweets! Break the chocolate into small squares and place in a large jug or bowl. Microwave on high for 30 seconds to 1 minute at a time, stirring in between, until it is completely melted. Be careful not to let the chocolate burn. Line a baking tray or dish with parchment paper and pour the chocolate on top, smoothing down with a spoon. Add the toppings to the chocolate whilst it is still warm and then place it in the fridge for 30 minutes to 1 hour or until the chocolate has set. Break the bark up and either eat straight away or pack into cellophane bags to sell!